The question is — what are they? A team of civil and environmental engineers is partnering with the Delaware Solid Waste Authority (DSWA) to study the composition of food waste that has been partially broken down in a digester machine. This insight could help them implement strategies to reduce the volume of food waste in Delaware's landfills. DSWA is charged with managing waste and recyclables throughout the state, and the agency operates three landfills — one in each of Delaware's counties. Roddy, who received a master's degree in civil engineering at UD, knew that UD civil and environmental engineers had the ideal expertise to tackle the problem of food waste in landfills. What's more, UD was already ahead of the curve in approaching the problem itself. The Caesar Rodney Dining Complex has two BioHiTech digesters, which use a proprietary mix of microorganisms to transform pieces of unwanted food — bread crusts, milk at the bottom of the cereal bowls, whatever students leave behind — into liquid waste. All the pieces were in place for a partnership. "The liquid contains organic carbon and nitrogen, and it is rich in energy potential," said Cha. The nutrient content differs slightly each day depending on the menu items served. 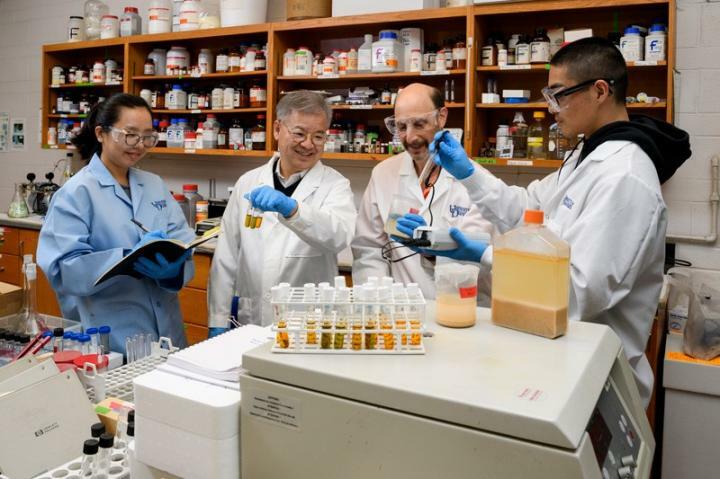 By understanding exactly what this liquid is made of, Cha might be able to develop smarter strategies to utilize it — through resource recovery, strategic re-use or other methods. Projects like these — which have the potential to tackle grand challenges in sustainability — are a hallmark of UD's College of Engineering.